A new mapping tool called Urban Layers is used to visualize the growth of NYC from 1765-present. Read more here. Interested in community-based participatory research methods? 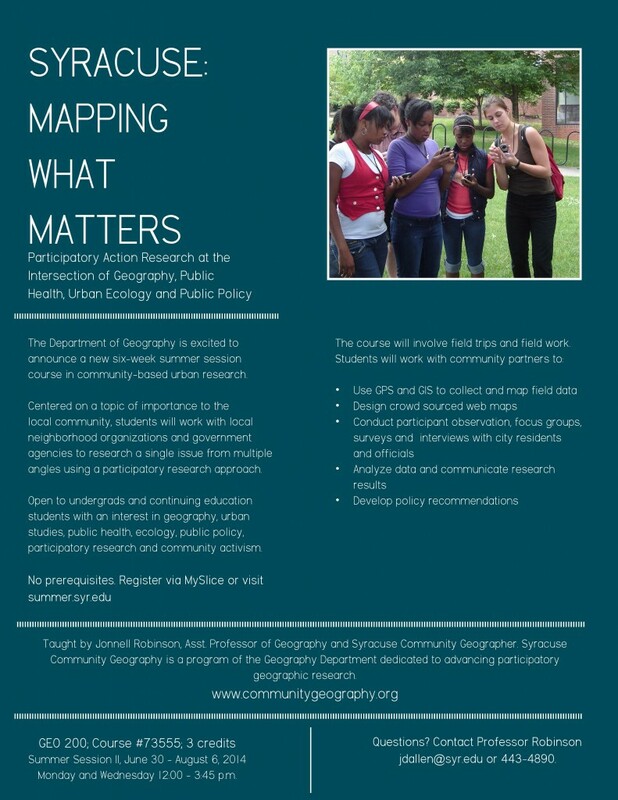 In this course you will examine how and why grassroots organizations utilize GIS and spatial analyses, as well as the origins, ethics, and challenges of participatory research with GIS. • How do grassroots community organizations and movements use maps to support their work? A frequent community partner, Syracuse Grows, recently held a very successful benefit dinner showcasing urban agriculture in Syracuse as well as the talents of refugee and new American chefs. You can check out a local news story on the dinner here. Imagine Durban, an urban planning project based off of Chicago’s Imagine Chicago, asks city dwellers what they don’t like about their city and starts projects based on their suggestions. A great example of collaboration ending in positive change. Read about the project here. Community Geography in the News! This article makes use of the new 2008-2012 ACS 5 Year Estimates, highlighting an increase in high-poverty neighborhoods across the United States. It also includes an interactive map and relevant poverty statistics.